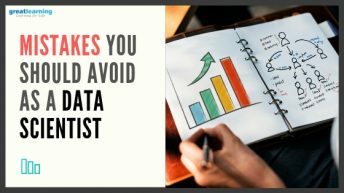 Hypothesis Testing is an essential part of statistics for Data Analytics, hypothesis testing is a statistical method used to make decisions based on statistics based on experimental data. In simple terms, it can also be called an educated guess or a claim or statement about a property or population. To analyze a sample in an attempt to distinguish between population characteristics, that are likely to occur and population characteristics that are unlikely to occur. A null hypothesis is the status quo. A general statement or default position that there is no relationship between two measured phenomena or no association among groups. The alternative hypothesis is the hypothesis contrary to the Null Hypothesis. It is usually taken to be that the observations are the result of a real effect. In statistical significance testing, the p-value is the probability of obtaining a test statistic at least as extreme as the one that was observed, assuming that the null hypothesis is correct. 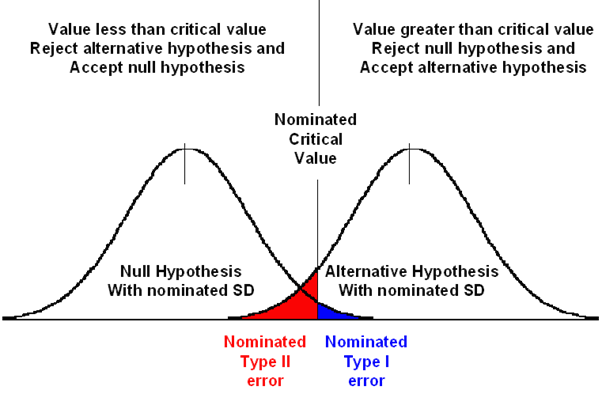 Note: If the P value is equal to or smaller than the significance level(α), it suggests that the observed data is inconsistent with the assumption that the null hypothesis is correct and thus this hypothesis must be rejected (but this does not automatically mean the alternative hypothesis can be accepted as true). α is the probability of Type l error and β is the probability of Type ll error. The experimenters (you and I) have the freedom to set the α level for a particular hypothesis test. That level is called the level of significance for the test. Changing α can (and often does) affect the results of the test- whether you reject or fail to reject H0. As α increases, β decreases and vice versa. The only way to decrease both α and β is to increase the sample size. To make both quantities equal to zero, the sample size would have to be infinite you would have to sample the entire population. The confidence coefficient (1-α) is the probability of not rejecting H0 when it is True. The Confidence level of a hypothesis test is (1-α) * 100%. 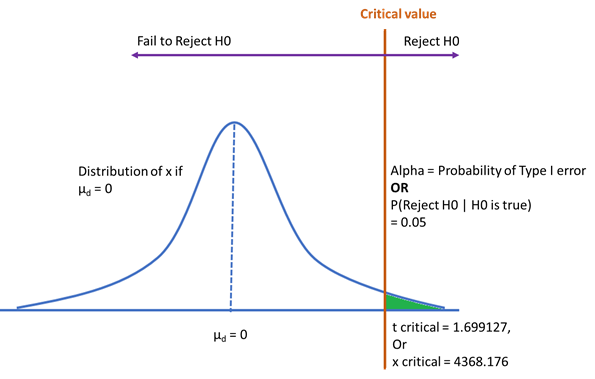 The power of a statistical test (1-β) is the probability of rejecting H0 when it is false. H1: µ > µ0, where µ0 is the comparator or null value and an increase is hypothesized –this type of test is called an upper-tailed test. H1: µ < µ0, where a decrease is hypothesized and this type of test is called a lower-tailed test. H1: µ ≠ µ0, where a difference is hypothesized and this type of test is called a two-tailed test. 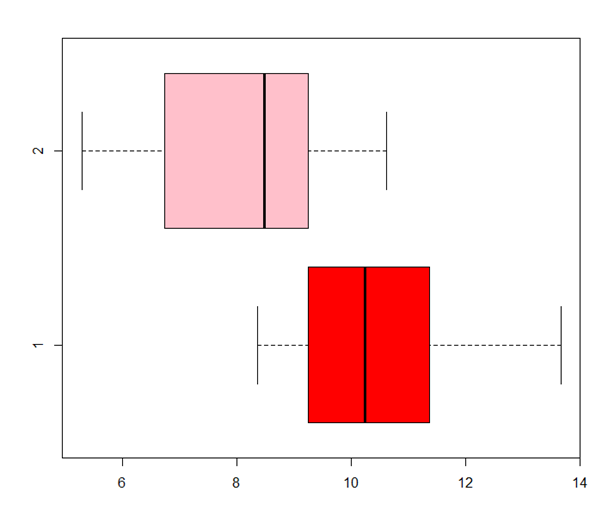 Independent (or unpaired two sample) t-test is used to compare the means of two unrelated groups of samples. Paired Student’s t-test is used to compare the means of two related samples. That is when you have two values (a pair of values) for the same samples. Experience Marketing Services reported that the typical American spends a mean of 144 minutes (2.4 hours) per day accessing the Internet via a mobile device. (Source: The 2014 Digital Marketer, available at ex.pn/1kXJifX.) To test the validity of this statement, you select a sample of 30 friends and family. The result for the time spent per day accessing the Internet via a mobile device (in minutes) are stored in Internet_Mobile_Time.csv file. What assumption about the population distribution is needed to conduct the test in A? A hotel manager looks to enhance the initial impressions that hotel guests have when they check in. Contributing to initial impressions is the time it takes to deliver a guest’s luggage to the room after check-in. A random sample of 20 deliveries on a particular day was selected each from Wing A and Wing B of the hotel. 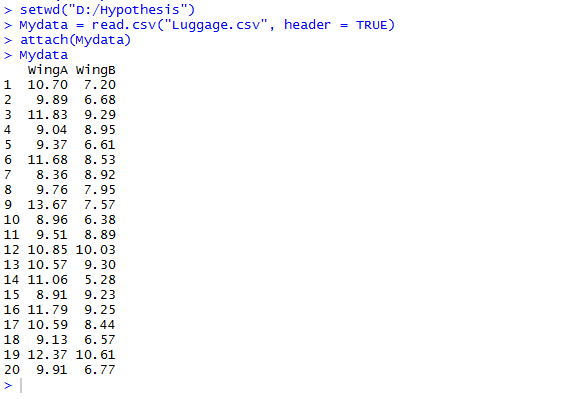 The data collated is given in Luggage.csv file. Analyze the data and determine whether there is a difference in the mean delivery times in the two wings of the hotel. (use alpha = 0.05). The Titan Insurance Company has just installed a new incentive payment scheme for its lift policy salesforce. It wants to have an early view of the success or failure of the new scheme. 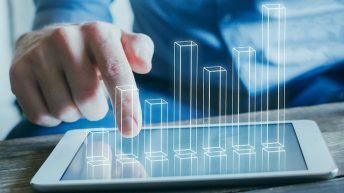 Indications are that the sales force is selling more policies, but sales always vary in an unpredictable pattern from month to month and it is not clear that the scheme has made a significant difference. 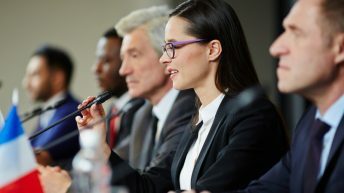 Life Insurance companies typically measure the monthly output of a salesperson as the total sum assured for the policies sold by that person during the month. For example, suppose salesperson X has, in the month, sold seven policies for which the sums assured are £1000, £2500, £3000, £5000, £10000, £35000. X’s output for the month is the total of these sums assured, £61,500. Titan’s new scheme is that the sales force receives low regular salaries but are paid large bonuses related to their output (i.e. to the total sum assured of policies sold by them). The scheme is expensive for the company, but they are looking for sales increases which more than compensate. The agreement with the sales force is that if the scheme does not at least break even for the company, it will be abandoned after six months. The scheme has now been in operation for four months. It has settled down after fluctuations in the first two months due to the changeover. Since given data are in 000, it will be better to convert them in thousands. Describe the five percent significance test you would apply to these data to determine whether the new scheme has significantly raised outputs? What conclusion does the test lead to? It is asked that whether the new scheme has significantly raised the output, it is an example of the one-tailed t-test. μ1 = Average sums assured by salesperson BEFORE changeover. μ2 = Average sums assured by salesperson AFTER changeover. HA: μ1 < μ2 ; μ2 – μ1 > 0 ; true difference of means is greater than zero. Since population standard deviation is unknown, paired sample t-test will be used. 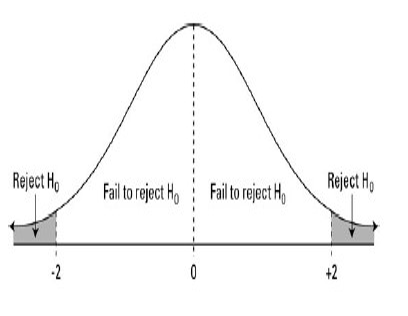 Since p-value (=0.06529) is higher than 0.05, we accept (fail to reject) NULL hypothesis. The new scheme has NOT significantly raised outputs. (a) The probability of a type 1 error? (b) What is the p-value of the hypothesis test if we test for a difference of $5000? 2.a. 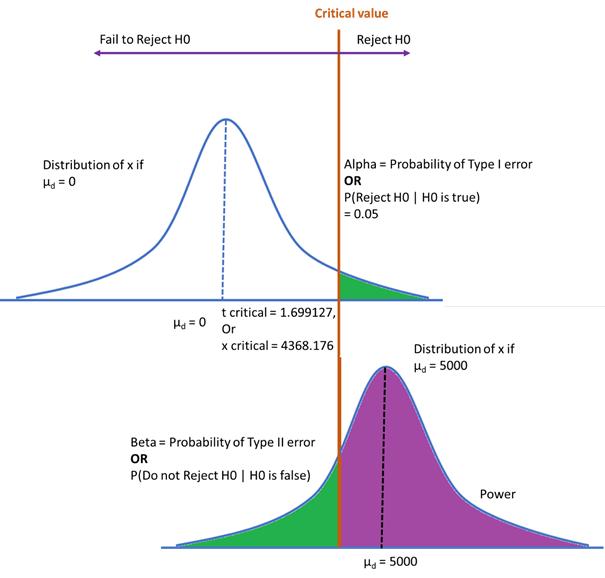 The probability of a type 1 error? 2.b. What is the p-value of the hypothesis test if we test for a difference of $5000? Let μ2 = Average sums assured by salesperson AFTER changeover. μ1 = Average sums assured by salesperson BEFORE changeover. This is a right tail test. 2.c. Power of the test. H0 will be rejected if test statistics > t_critical. With α = 0.05 and df = 29, critical value for t statistic (or t_critical ) will be 1.699127. Hence, H0 will be rejected for test statistics ≥ 1.699127. Hypothesis testing should always explain what you expect to happen. It contains both an independent and dependent variable. It should be testable and measurable. It may or may not be correct. You have to ascertain the truth of the hypothesis by using Hypothesis Testing. Hypothesis testing is the use of statistics to determine the probability that a given hypothesis is true. The usual process of hypothesis testing consists of four steps. Formulate the null hypothesis(commonly, that the observations are the result of pure chance) and the alternate hypothesis(commonly, that the observations show a real effect combined with a component of chance variation). Compute the p-value, which is the probability that a test statistic at least as significant as the one observed would be obtained assuming that the null hypothesis was correct. The smaller the p-value, the stronger the evidence against the null hypothesis. Compare the p-value to an acceptable significance value a(sometimes called an alpha value). If p <= a, then the observed effect is statistically significant, i.e., the null hypothesis is ruled out, and the alternative hypothesis is valid.